Wedding day should be a glorious and blissful day for the bride. So, everything has to be perfect, especially the hair. During your big day, you should not be bothered by frizzy hair, hairdo retouches and other hair problems. So, the right thing to do is to decide a few days or weeks before your wedding day so you can pick the best one that will work magnificently with your dress. Curly hair is the typical option for brides. It is primarily because of the meekness that curly hair could add to your look. If you are opting for a more charming and feminine look, then go ahead and have your curls done for your big day. This is also great because if the curls are done the right way, your hairstyle would remain looking great the entire ceremony, wedding reception, up until the after-party! All you wedding photos would look amazing. On the other hand, if your hair is naturally straight and smooth, maintaining the curls may be quite a challenge. After a few hours, the locks might no longer be entwined especially if you are letting your hair down. For this type of hair, it would be better to just flaunt your gorgeous straight hair and let your natural beauty shine! Deciding between letting your hair down and an updo will depend on the type of dress that you are wearing. If your wedding gown exposes a bit of skin like an off shoulder, strapless, v-neck or backless dress, letting your hair down might be a good option. This gives a more balanced look. On the other hand, a closed neckline dress would look more stunning if you will pair this up with a neat updo. 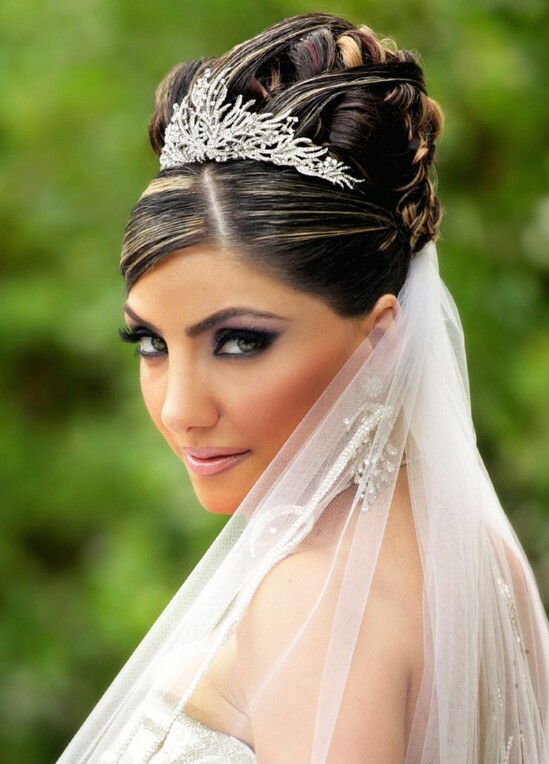 The feel of your wedding is also a factor which would help you in choosing between the two hairstyles. For a strictly formal wedding, it is best to style your hair in an intricate bun, chignon or French twist. For a more casual setting like a beach or garden wedding, allowing your tresses to go with your every move is more appropriate. This is a very common dilemma for brides. On your special day, keep in mind that the important person is you, as the bride. Do not let too many embellishments overpower your beauty. For a fully adored gown, the best option is to refrain from using any additional accessories on your hair. For example, if your gown already has a myriad of rhinestones, beadwork, embroidery, lace and other trimming, keeping your hairstyle simple is the way to go. If you are wearing a dress with a simplistic cut, then accentuate your look using hair accessories. There are hair ornaments which will make your day extra special. A tiara would work best if you are wearing a veil. This will not just be another decoration but will also keep your veil from falling off. Clips, barrettes, headbands and comb which have rhinestones contribute a lot in making you look more elegant. Another great option are small flowers to achieve a meek and gentle aura.